Four peaches from my home state, SC. I just returned from a trip to South Carolina. 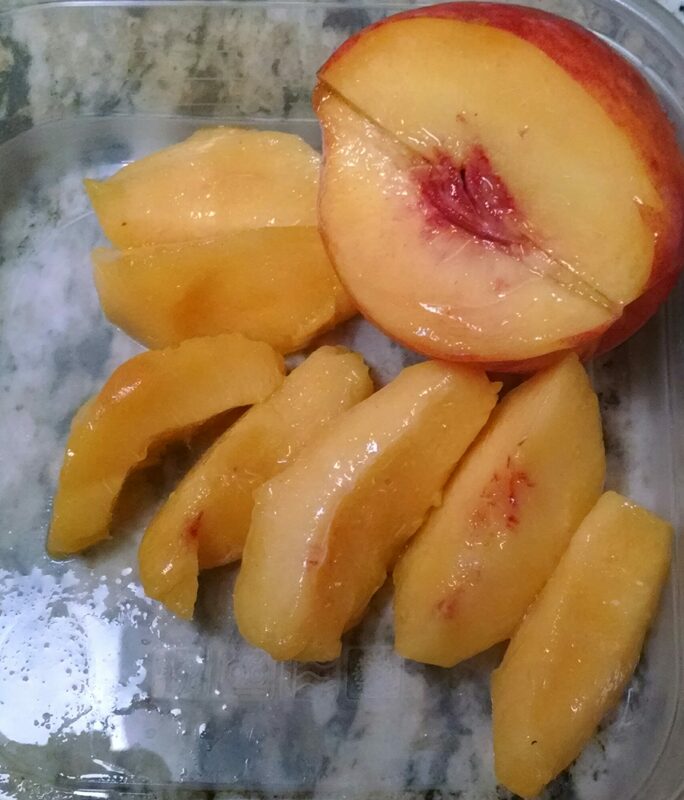 And of course I brought back some South Carolina peaches to share and to eat. Ever since I can remember, my family always loved South Carolina peaches. There is just something about their juicy, sweet, peachy goodness, that sets them apart for me from all other peaches. (I have to interject here that some parts of Georgia and at least western parts of North Carolina grow the same peaches.) Since I grew up in South Carolina I will just talk about SC peaches. I love SC PEACHES!! I just found out that peaches originated in 2000 BC and were written about as being a delight to the Chinese emperors of the 10th century. During the reign of the Persian Empire, Persian Apples (peaches) traveled with Persian traders and reached the Roman empire and that of Alexander the Great. Well Alexander the Great spread them wherever they had not been sampled before across Europe and everywhere else practically. Peaches eventually came across to America in SC in the 1600’s. The Native Americans spread the seeds as they traveled and that’s how they got all over our country. So what is so peachy about South Carolina peaches? SC peaches have made my home state the biggest peach producer on the Eastern part of our country, Georgia comes in second. But to me that only speaks to the goodness of these fruits, so full of vitamins and flavor. 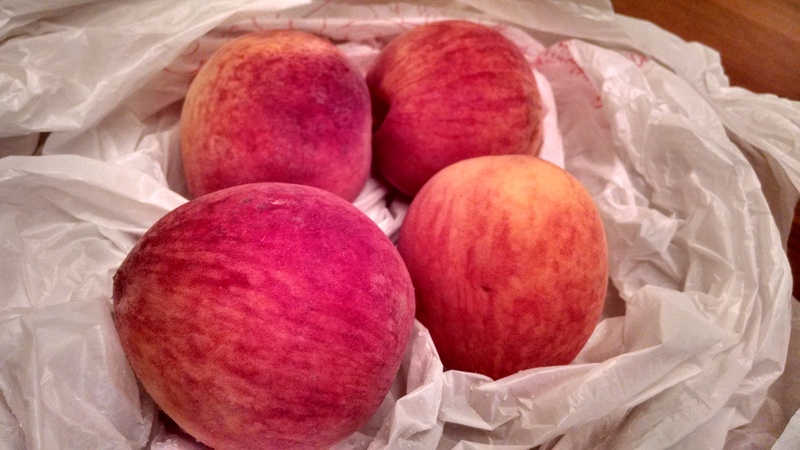 The SC peaches I found to generally be bigger, juicier, more flavorful, more enjoyable (Oops, I am prejudiced). Some peach lovers described them as having a fruity, honey taste. The outside of the peach is also a beautiful pinkish color and the fruit itself has a marvelous aroma that lures your mind into a craving for more. So on with the peachy hospitality. Since I live in North Carolina I make a trip to South Carolina to see family about every 6-8 weeks. When I can, I schedule a trip to SC during peach season. I usually buy one half of a peck to share with my family and friends here at my home in North Carolina. So after returning from one of these trips, I was eager to share my home state’s amazing peaches; just to see the faces of my family and friends as they savored the peachy joy. I was raised to always offer something to drink or eat to a guest, and being loaded with a good supply of peaches, when one of my son’s friends came over to visit, I figured he had never had the pleasure of tasting the SC juicy, wonderful peaches. So I asked if he would like one. I figured he didn’t want to “put me out” (Southern(?) expression for “inconvenience”). So I waited a little while and told him if he wanted to try one I would peel and cut it up. Perceiving his reticence as extreme politeness I prepared a couple of peaches for myself (and whoever else might want one) and offered him one last chance to enjoy even a taste of a wonderful succulent, sweet South Carolina peach. After all who could resist a South Carolina peach??!! Okay, his loss, my gain. (lol!) None for him, more for me! I didn’t pester him any more. Somehow this story got around to my son’s other friends and I had a reputation….for offering peaches, water, or food to anyone who came to my house. But I still wonder if that nickname is remembered by the other people in my son’s group. Oh, well I bet he will regret someday not at least trying one bite!! Pizza, Fried Chicken, French Fries?? No Thank You. Great post – During the summer, I drive down past the Peach Watertower a couple times a month for these delectable beauties! Tammi are they still in season?? I am going there later this month and want to pick up some. ,Oh, thank you! Glad that you liked this post!! I never dreamed one of my readers would have had some of those peaches. You don’t think I was too pushy with the friend do you? Thanks. I think your photography is fascinating. You see beauty in the unusual things, like I do. I remember them fondly. We lived in SC for 4 years. Peaches were always a favorite. (But, I peel them, don’t like the texture of the skin). I always peeled them because of the possibility of insecticides. I definitely liked the insides the best. Thank you for your comment! Delighted that it brought back some memories for you. Where in SC did you live? Summerville. About 20 miles north of Charleston. Oh, I think I drove through there once. I grew up in Greenville. Nice photo of a peach, I would give anything to taste that peach, it is right on the end of my tongue now, anything for the taste of summer instead of winter. Thank you, I am delighted that you enjoyed the photos as much as the post!! Wish I could ship some to you! Now you have my mouth watering and laughing at the same time – Betty Crocker on Acid, priceless. Many do not know that there are many varieties of peaches, and that the varieties produce fruit for maybe 10 days ortwo weeks, followed by a different variety. The freestone peaches come in around the end of June or start of July. Opinion here: the tastiest variety is the O’Henry, a peach that shows up in early August. Not to be missed. The Big Red comes shortly thereafter and is a worthy competitor. I have been told that the perfect climate for peach growth is a place where the temperature drops to 40 degrees 100 times in the calendar year. This is one of the things that makes the Spartanburg County and Cherokee County peaches in SC superior to the “Sand Hill” peaches and other area. Not too besmirch other peaches; they are all good, but some are better than others. Most know that Georgia is the “Peach State”, and some know that more peaches are grown in Spartanburg County than in the entire state of Georgia. Ditto for Cherokee County. Very interesting. Are certain named peaches grown in certain areas or is it more a matter of the farm they grow up on? Thanks for your deliciously descriptive tale! Peaches is a wonderful nickname!! (Better than Betty Crocker on acid! Lol). Glad you liked this post. Everytime I bring peaches home from SC, I think of this story. Being an Alabama girl, I’m partial to Clanton peaches, heh! But this is a fantastic post. Now I’m craving peaches! They do kind of grow on you! Lol. Thank you for commenting! I love learning old phrases. I’ve heard ” love you a bushel and a peck…” but had no idea that the term “peck” was meant for measuring dry goods. I had to look it up and saw that it is a unit of 2 dry gallons. A bushel and a peck means a whole lot plus a little more. Sorry for geeking out but I love learning old phrases. Great post – I’ll be back! Hi, thank you so much, Tim. Delighted that you are enjoying learning about Southern expressions. I also wrote a post titled,https://joyful2beeblogs.com/2017/02/14/southern-expressions-that-will-crack-you-up/ . I bet you will enjoy the video from a series of episodes that are pretty funny.